Albert Welles, History of the Buell Family in England, , at https://books.google.com/books?id=ma4aAAAAYAAJ . New York: Society Library, (1881) , p. 93. 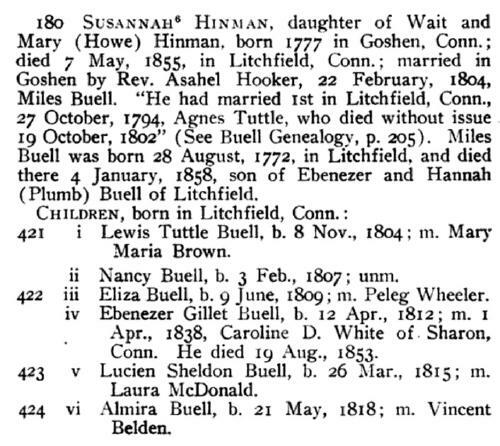 Mrs. Harriet Weeks (Wadhams) Stevens, Wadhams genealogy, proceded by a sketch of the Wadham family in England, , at https://books.google.com/books?id=SHFZAAAAMAAJ . New York: Frank Allaben Genealogical Company, (1913) , p. 161. A Memory of the Buell centennial reunion, , at https://archive.org/stream/cu31924029819616 . Bloomfield, N.Y.: (1899) , p. 57. Alvin Lee Rhods, The Royce Family in America, , at https://books.google.com/books?id=e-5OAAAAMAAJ . Madison, AL: (2005) , p. 86. Albert Welles, History of the Buell Family in England, , at https://books.google.com/books?id=ma4aAAAAYAAJ . New York: Society Library, (1881) , p. 205. Mrs. Harriet Weeks (Wadhams) Stevens, Wadhams genealogy, proceded by a sketch of the Wadham family in England, , at https://books.google.com/books?id=SHFZAAAAMAAJ . New York: Frank Allaben Genealogical Company, (1913) , pp. 160-1. Albert Welles, History of the Buell Family in England, , at https://books.google.com/books?id=ma4aAAAAYAAJ . New York: Society Library, (1881) , p. 206. A Memory of the Buell centennial reunion, , at https://archive.org/stream/cu31924029819616 . Bloomfield, N.Y.: (1899) , p. 58. 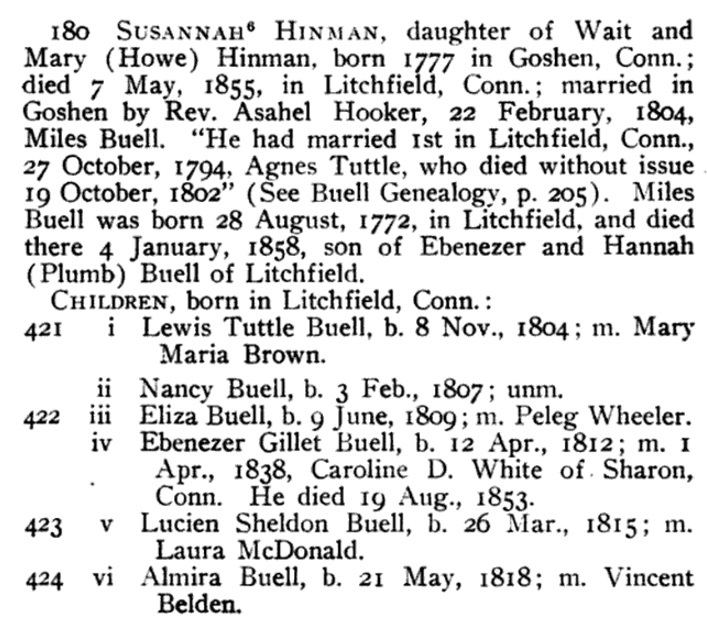 Mrs. Harriet Weeks (Wadhams) Stevens, Wadhams genealogy, proceded by a sketch of the Wadham family in England, , at https://books.google.com/books?id=SHFZAAAAMAAJ . New York: Frank Allaben Genealogical Company, (1913) , p. 88. "United States Census, 1880," database with images, FamilySearch (https://familysearch.org/ark:/61903/1:1:MFC2-VGD : 14 July 2016), Thomas A Elliott, Torrington, Litchfield, Connecticut, United States; citing enumeration district ED 13, sheet 250D, NARA microfilm publication T9 (Washington D.C.: National Archives and Records Administration, n.d.), roll 0101; FHL microfilm 1,254,101.